Displays very low toxicity toward normal cells. Purified native Hsp90 protein or cell lysates from HER-2-overexpressing cancer cells (BT474, N87, SKOV3 and SKBR3) or BT474 breast carcinoma cells in lysis buffer (20 mM HEPES, pH 7.3, 1 mM EDTA, 5 mM MgCl2, 100 mM KCl) are incubated with various concentrations of 17-AAG for 30 minutes at 4 °C, and then incubated with biotin-GM linked to BioMag streptavidin magnetic beads for 1 hour at 4 °C. Tubes are placed on a magnetic rack, and the unbound supernatant removed. The magnetic beads are washed three times in lysis buffer and heated for 5 minutes at 95 °C in SDS–PAGE sample buffer. Samples are analysed on SDS protein gels, and western blots done using indicated antibodies. Bands in the western blots are quantified using the Bio-rad Fluor-S MultiImager, and the percentage inhibition of binding of Hsp90 to the biotin-GM is calculated. The IC50 reported is the concentration of 17-AAG needed to cause half-maximal inhibition of binding. Method: Cells are seeded in 96-well plates at 2,000 cells per well in a final culture volume of 100 μL for 24 hours before the addition of increasing concentrations of 17-AAG that is incubated for 5 days. Viable cell number is determined using the Celltiter 96 AQueous Nonradioactive Cell Proliferation Assay. The value of the background absorbance at 490 nm (A490) of wells not containing cells is subtracted. Percentage of viable cells = (A490 of 17-AAG treated sample/A490 untreated cells) × 100. The IC50 is defined as the concentration that gave rise to 50% viable cell number. Features:A synthetic derivative Geldanamycin, with lower hepatotoxicity than parent antibiotic & higher potency and bioavailability than the similar derivative 17-AAG. 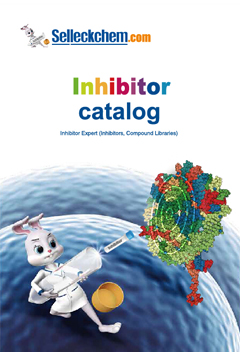 NVP-HSP990 (HSP990) is a novel, potent and selective HSP90 inhibitor for HSP90α/β with IC50 of 0.6 nM/0.8 nM. 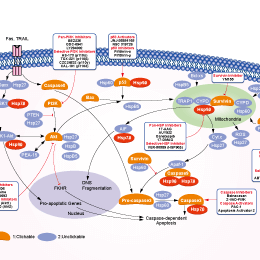 Features:NVP-HSP990 is an orally available HSP90 inhibitor and is structurally distinct from other clinical HSP90 inhibitors.